In the past 20 years, this book has never been out or print. Celebrate this milestone Abingdon has created this Anniversary Edition!James W. Moore is a master storyteller. Individuals and groups across the country have read and enjoyed his books and what they reveal to us about God and our selves. In this book, Moore observes that people often give lame excuses for their arrogance, dishonesty, hostility, and presumptuousness. He challenges readers to recognize such situations and to grow beyond them. He addresses such sins as half-heartedness, spiritual arrogance, deception, overreaction, hostility, presumptuousness, losing spiritual balance, and more. He also discusses the joys of redemption and grace. . Celebrate the 20th Anniversary of this beloved, never out of print, James Moore book with this special edition that includes a new introduction by the author. Why do we try to justify anything and everything we want to do? We use words, scapegoats, blaming other people, circumstances, past events, even evil spirits (the devil made me do it!) to attempt to excuse bad choices we make with our own free will. Moore challenges readers to recognize such situations and to grow beyond them. He addresses such sin as half-heartedness, spiritual arrogance, deception, overreaction, hostility, presumptuousness, losing spiritual balance, and more. is more interested in forgiving us than in hearing our excuses. wants penitence - not excuses - from us. In his warm, embracing style, James Moore encourages us to seek forgiveness. After all, we are justified by the grace of a loving, caring, forgiving, God and not our eloquent excuses. Perfect as a 12 session small group study using the Leader Guide in back. 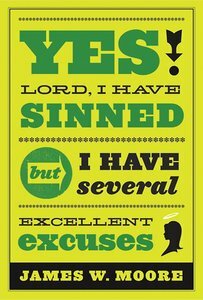 About "Yes, Lord, I Have Sinned (25th Anniversary)"